Ryan is one of the most exciting actors of his generation and ‘Lost River’ reveals that he is also one of its most promising young directors. His debut film is a singular vision of stranded people finding connection in a broken world. We believe in this film and in Ryan as a director, and are delighted to be working with him in this new role. This is a great opportunity to give audiences the chance to discover this compelling, original work for themselves. The film, from Sierra Affinity, Phantasma Films and Bold Films, stars Christina Hendricks (TV’s “Mad Men”), Saoirse Ronan (“The Grand Budapest Hotel”), Iain De Caestecker (TV’s “Agents of S.H.I.E.L.D.”), Matt Smith (TV’s “Doctor Who”), Reda Kateb (“Zero Dark Thirty”), Barbara Steele (TV’s “Dark Shadows”), with Eva Mendes (“The Place Beyond the Pines”), and Ben Mendelsohn (“The Dark Knight Rises”). In addition to directing the film, Gosling also wrote the screenplay. The producers are Marc Platt (“Into the Woods”), Gosling, Adam Siegel (“Drive”), Michael Litvak (“Nightcrawler”) and David Lancaster (“Nightcrawler”). Gary Michael Walters and Jeffrey Stott served as executive producers. Johnny Jewel (“Drive”) composed the film’s music. This film was, in a lot ways, a gift from the directors I’ve been working with over the last few years. I’ve gone between acting in films completely based in reality with Derek Cianfrance to the fevered dreams of Nicolas Winding Refn. I think I’ve vacillated between these two extremes because my own sensibilities as a filmmaker lay somewhere in-between. It’s not until I had the opportunity to work on The Ides of March that I was introduced to Detroit, a place that is currently living on the border of those two realities. Although I was only there for a few days I couldn’t help but be affected by the city. It was on the verge of declaring bankruptcy. There were forty miles of abandoned neighborhoods and, within pockets of those neighborhoods, there were parents trying to raise their children on streets where houses were being burned and torn down around them. Detroit was the birthplace of the Model T, Motown and the middle class. It was, at one time, a postcard for the American Dream but now, for the families in these neighborhoods, the dream has become a nightmare. Having said that, there is still a lot of hope there. There is something very inspiring about the consciousness in Detroit. What it once was and will be again is still very much alive. I knew I had to make something there. I kept returning over the following year, trying to document some of these neighborhoods before they were torn down or destroyed and I began to think of a story that took place not in Detroit, but in Lost River, an imagined city with an imagined past. As the elements of the story began to emerge; a family losing their home, a mysterious secret beneath the surface, I drew from the 80’s family fantasy films that I grew up with and filtered them through the sensibilities about film I’ve acquired since. 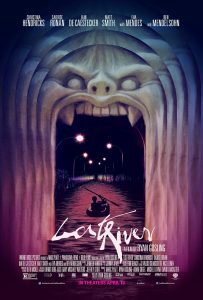 With that, Lost River began to take shape for me in the form of a dark fairy tale with the city itself as the damsel in distress and the characters as broken pieces of a dream, trying to put themselves back together. Ryan Gosling: “I wanted to make this film because it’s a movie that I would want to see. Like many children who grew up in the 1980s, I first approached the cinema through mainstream films. I was excited to shoot this kind of story, but with the language of filmmaker that I’ve acquired through the years”. Christina Hendricks: “Ryan was amazing. This is his first film, and we had some disappointments: one day a torrential rains, another one we lost a camera… In these cases, he took things as they come and found an immediate and creative solution to overcome obstacles. Moreover, being an actor himself, he gives very useful information about the characters, and he knows how to talk to actors. I think everyone really respect his vision, imagination, his enthusiasm and creativity”. All the actors agree in saying Ryan’s experience in being himself an actor has created a serene atmosphere and a great collaborative relationship. “He is very attentive, always perceives what others feel and he knows our mind “said Saoirse Ronan. “He is kind, very careful and he approaches things from an original angle, which I like a lot. In addition, he is calm, concise, and his vision is personal and well defined, but that did not stop to let others make their own contribution,” says an enthusiastic Matt Smith. Ryan never wanted to have a role in the movie: “This would not have been very responsible on my part, because the film is quite ambitious. There are lots of actors who become directors, it gives the impression that it is easy, but it is not. I had a lot to do in making the film, I thought it was better to focus on that”. Detroit was used as base for the imaginary city of Lost River and she has a great role in the movie. Ryan knew no other cities could express the same desolation and unreal beauty of Lost River. “Some iconic films of the 1950s, like THE OUTSIDERS or AMERICAN GRAFFITI, even if they do not take place in Detroit, were certainly influenced by what was happening. The film thus shows how the American dream has turned into a nightmare, at least for the people who live there” says Ryan. Ryan also thought filming in Detroit could have allowed the actors to anchor their interpretation of reality. “Shooting in Detroit, allowing them to walk around this city in ruins gives the film an authenticity that perhaps would not have otherwise,” he says. “The environment is everything. When we were tracking and during filming, we met with residents of these neighborhoods, and they are now part of the scenes we shot and of the universe we created. There is still a lot of hope in Detroit. That is why this is the only place where we could make this film. It’s a city that gives creativity and inspiration, and I hope that other productions will use the talents and opportunities that exist here. Have a look below to see the official score list for the 2014 Fantasy movie, Lost River.